It Can read and write ATA protocol 16bit PCMCIA flash card, PCMCIA transfer SD card PCMCIA transfer CF card. Note: this product does not support 32bit CARDS, panasonic P2 CARDS, SRAM CARDS, communication CARDS and PC CARDS that need to be driven. Specially designed for ATA Card, support PCMCIA interface PC card, ATA memory card and CF transfer PCMCIA or SD transfer PCMCIA card,PC SD Card Adapter, PC CF Card Adapter, ATA Flash Storage, Mass Storage Card, PCFLASHDISK, PC Card ATA, and Pcmcia Flash memory Card for industrial machine. Supporting windows 98 previous system : WINDOWS 7,WINDOWS XP, WINDOWS 2000,WINDOWS VISTA&WINDOWS ME,No need to install drivers, just insert cards into the USB slot then make USB connect your computer,plug and play. Support PCMCIA hot plug, plug and play, do not need to power off, do not need to pull the USB interface, directly change the card,it will It automatically recognizes, use push rod to press the PC card out. 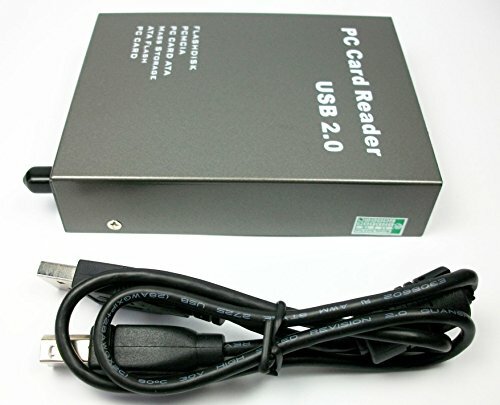 Note: this product can can not read and write PCMCIA card itself with protocol or which need to install the driver. Such as PCMIA SRAM CARD, panasonic P2 card, A2 card, SRAM card, wireless network card, sound card, program data card , PCMCIA LINEAR CARD, FLASH MEMORY CARD and other PCMCIA communication CARD or card with switch or battery,etc. Package content : 1 X PC card reader, 1 X USB cable. If you have any questions about this product by YZC, contact us by completing and submitting the form below. If you are looking for a specif part number, please include it with your message.